Although actually is difficult to imagine the Mexican food without cheese, the truth is that in the Prehispanic times it was not consumed. The Spaniards where the ones that brought the cows and the goats into the “New World". And of course that the Mexican cuisine rapidly adopted this food and it has a wide variety of typical dishes that require cheese for their preparation. 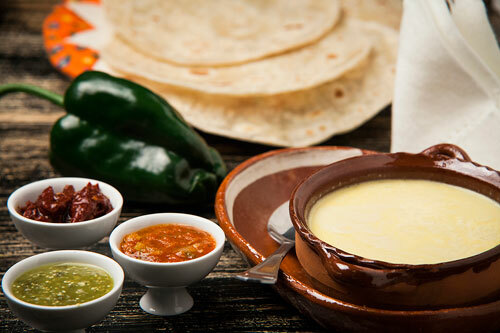 The melted cheese is a typical recipe of taquerias and from northern Mexico . The recipe is quite simple, it only consists of melted cheese, which is accompanied with tortillas with which a kind of quesadillas can be made and they can be accompanied with a tasty salsa. We recommend serving the melted cheese as appetizer and it can be put on the center of the table so everybody can enjoy its tasty flavor. To make this recipe only the cheese has to go into the oven and tortillas are heated. A super easy to make recipe. Without a doubt the best cheese to make the Mexican melted cheese is the Chihuahua cheese. If you don’t get this cheese you can also use the Adobera cheese or the Monterey Jack cheese. In Mexico it is a custom to serve the melted cheese with flour tortillas and you can prepare them with your homemade touch. If you prefer maize tortillas they can also be employed in this recipe. If possible present the melted in a small clay cazuela, it will look divine and very Mexican. Grate 7 oz of cheese that melts and put it in a baking dish. The advantages of using grated cheese is that it melts faster and a better consistency is obtained. Put in the oven the baking dish and leave the cheese that was grated baking for about 10 minutes, until it has melted. Recommendation: Give more flavor and hotness to your melted cheese with one of these salsas: the red salsa , the green salsa with avocado , the chipotle pepper salsa , the pico de gallo salsa , etc. Variations: Some ingredients can also be put to the melted cheese like: chorizo , mushrooms , peppers , etc. If you need a tortilla container that keeps the tortillas warm on the table for a long time. The “Norpro Tortilla Container" is excellent to maintain your tortillas soft and warm. Do you need some tortillas for your melted cheese? With the “Old el Paso Flour Tortillas" you will have soft, tasty and good size tortillas. This is the cheese that we talked about the “Chihuahua Cheese", which you have to use to prepare the best melted cheese that you have tasted.